Who's Yer GoDaddy? GoDaddy DNS Down! About 2:15 EDT today I began to get alarms from some of my monitoring software that it "can't resolve hostname to IP address" for a couple of our lesser used domains. So, after a little digging it looks like GoDaddy DNS (and other services) are down currently. Blinc M2 with FM Tuner Review - DO NOT BUY! Enough is enough! I've intended to write this review for some time now, but have neglected. Now is the time. I don't usually do product reviews but this must be said. 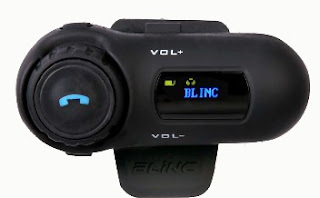 SPOILER ALERT: DO NOT BUY the Blinc M2 with FM Tuner! And don't expect any kind of customer support or service from Quickline Motorsports! The first issue with the Bluetooth phone headset is that no one can hear me while on the phone if I'm moving more than about 20 MPH. And, often even when I'm stopped callers say they cannot hear or understand me. Then, after a call (whether the call is miss or answered, and whether an answered call is disconnected by my or the caller) the music being played via my phone's MP3 player gets very choppy. Immediately after a missed or disconnected call the music cuts out randomly for from one to several seconds. The only way to correct this is to turn it off, then back on. And that doesn't always work. Not to mention the fact that this is difficult and dangerous while driving. Note: I've tried three different phones and all have experienced the same issue. Next, numerous times the Blinc M2 has just frozen. Whenever this happens the display will show either the phone number of the last caller or some message like BLINC, or CONNECT. The only way to recover from this condition is to use the reset key that came with the unit. After resetting the unit has to be paired with my MP3 player (i.e. phone). Decent headset for music from an MP3 player. Controls are OK. Ability to advance to next (or previous) track is nice. Volume controls OK. It took me a couple weeks of use to figure out the pattern of exactly what was happening and when. At that point I called Quickline Motorsports where I purchased this thing. I called three times. Two of the times I got through to what I assume was a receptionist, who after pleading my case promised to have someone with authority call me. No one ever did. The third time I left a voice mail which was never returned. I also sent two emails to their supposed support department, neither of which was answered. I will NEVER buy anything again from Quickline Motorsports cannot recommend them. The bottom line is that this is an adequate headset for music from an MP3 player, but nothing else. Definitely not what it promises, nor worth the $150 or so MSRP. Previously I wrote about a great Amazon AWS management tool, Elasticfox, which is, or was, an extension for Firefox. I started using Elasticfox a few years ago when I started using Amazon's EC2 (Elastic Compute Cloud) service. At the time Amazon's Management Console wasn't all that great; it lacked many features and was a little tough to navigate, so I relied heavily on Elasticfox. Since development of Elasticfox stopped on Firefox 3 it's been a while since it would work anyway. 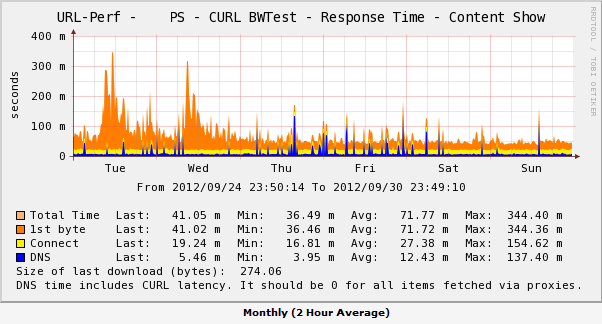 Alas, a guy named Genki Sugawara picked up the torch and actively develops Elasticfox-ec2tag. 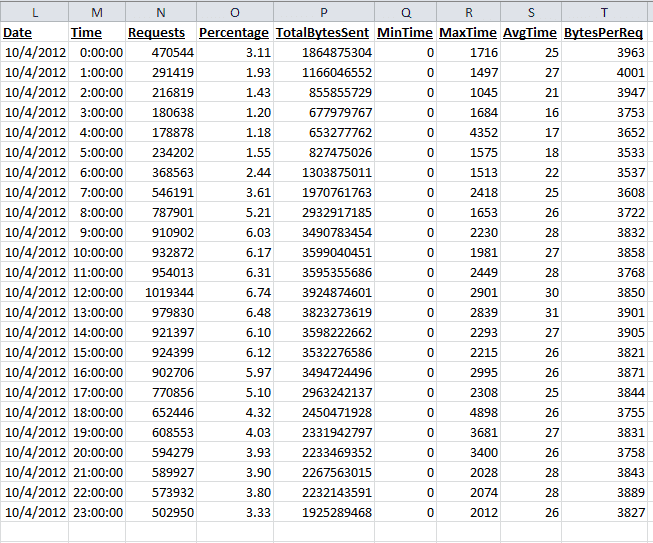 Not only is Elasticfox-ec2tag a great Firefox plugin, it also has a pretty good stand-alone app. In all fairness Amazon's Management Console has come a long way. And I use it regularly. But, and this may be because of my history using Elasticfox, I use Elasticfox-ec2tag faithfully. In fact, it's always the first tab in my browser. With Elasticfox-ec2tag I can easily view and manage my EC2 servers, AMI images, Security Groups, EBS volumes, Elastic Load Balancers, etc. With it I can easily connect to any of my AWS accounts, and any AWS region within each account. I really like that you can customize the columns, both which to view and their order. 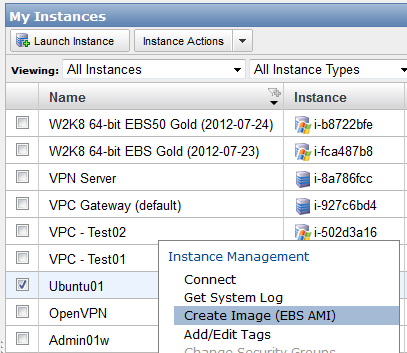 Another great feature it supports is the EC2 name tag which is also supported by the AWS Management Console. 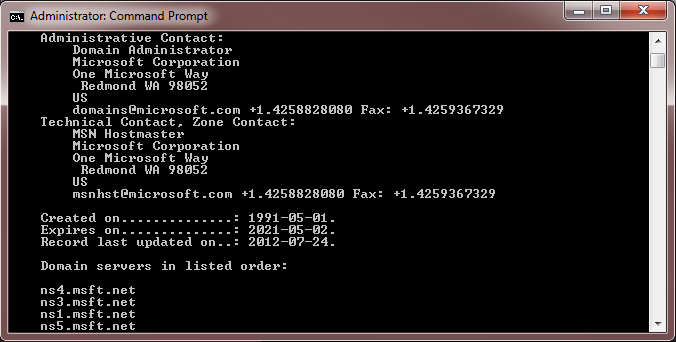 With this I can assign a meaningful name to each instance and view that name in both tools. 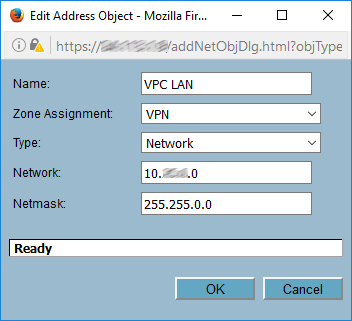 You can download the latest Elasticfox-ec2tag Firefox plugin (.xpi file) directly from Amazon at http://elasticfox-ec2tag.s3-website-ap-northeast-1.amazonaws.com/. If you haven't used Elasticfox-ec2tag I would highly recommend giving it a try. I'm setting up a new "base" image for some servers I'm starting in Amazon's us-west-1 region. I started with a Ubuntu image built by RightScale, then did some basic setup to customize the image. Now I need to increase the root EBS volume a bit. Then I can use this as my own base image for starting new Linux servers. Note: I use a combination of tools to manage my EC2 instances and EBS volumes, from Amazon Management Console, to command line tools, to ElasticFox. Often the tool I use depends on the way the wind is blowing on a particular day. For this post I'm using the Amazon Management Console. For info on the command line tools see the previously mentioned post. Finally, one critical step cannot be completed using ElasticFox. 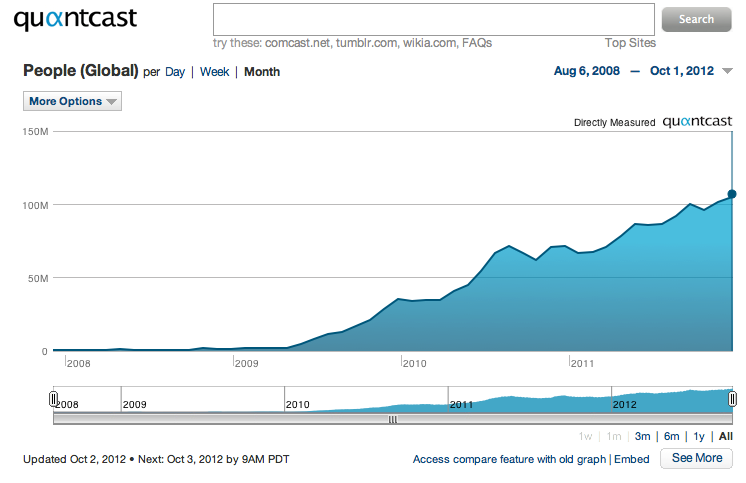 The next step is to create a snapshot of the volume. This can be done a few different ways. Using various tools (command line tools, Elasticfox, EC2 Management Console, etc.) a snapshot of the volume could be created. Or, (my preferred method) is to create an AMI of the instance which creates a snapshot of the volume, and gives me a an AMI from which I can launch other, similar instances. 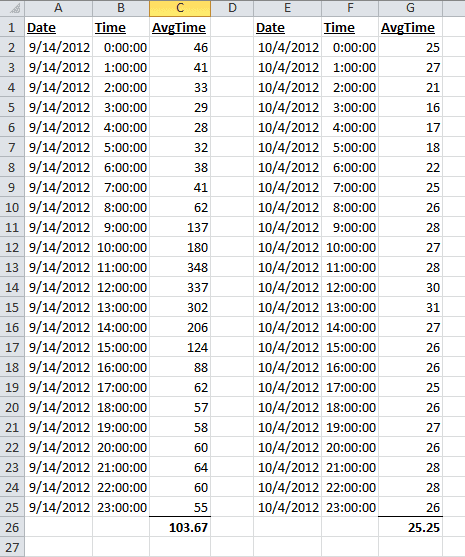 FYI creating an AMI creates a snapshot of the volume. 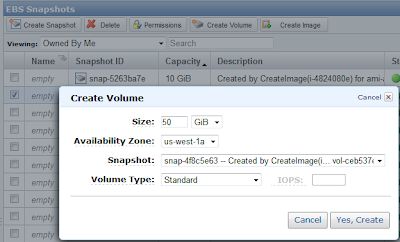 Once the AMI and/or snapshot is complete create a new volume of the size you desire from the snapshot, which has to be in the same availability zone as the instance. My instance is in us-west-1a so I'll create my new volume will be in that AZ. 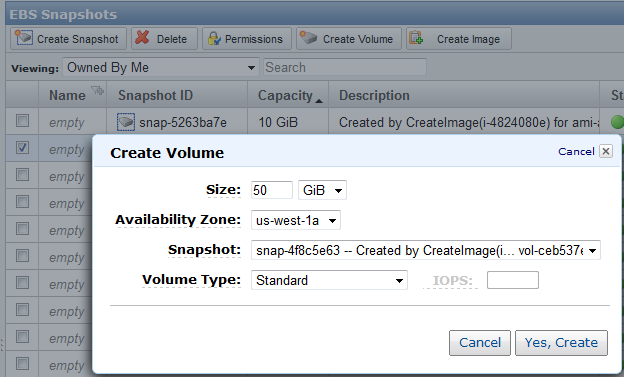 In the AWS Console select Snapshots under Elastic Block Store, right-click the volume's snapshot and select Create Volume from Snapshot. Specify the size you want. 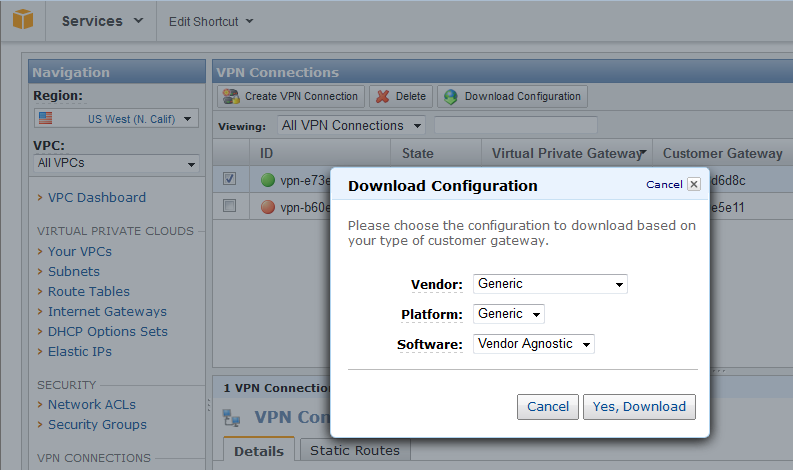 And, again, make sure to create it in the same AZ as your instance. 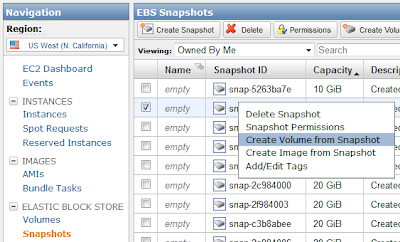 Next, stop your instance, detach the current volume, the attach the new volume (under Elastic Block Store, Volumes right-click your new/available volume, select attach EBS volume). 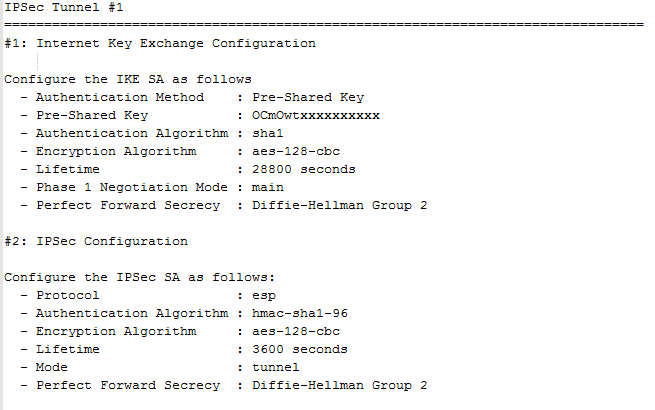 When attaching the new volume select your "stopped" instance and specify /dev/sda1 for the device. This is the default first volume. Click yes, attach. Then start your instance and connect to it. After connecting to your instance with its new volume if you run df it will report the original volume size, not the new size. 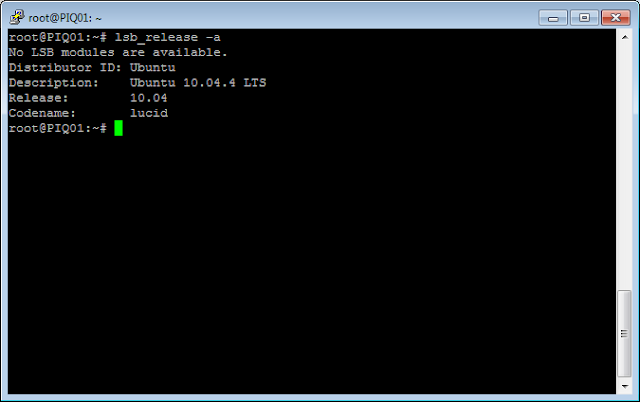 So, the final step is to run sudo resize2fs /dev/sda1 in Ubuntu. Once this is complete you can run df to see the new, increased size of your volume. The last thing would be to delete the volume you detached from this instance. Oh, and perhaps to make a new AMI. 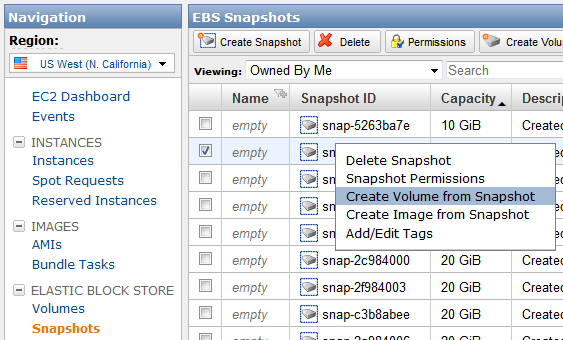 Now, not only do you have a larger EBS volume on this instance, future instances made from (your new) AMI of this instance will have the same size volume. What Version of Ubuntu Am I Running? How to check the version of Ubuntu you are running from the command prompt / terminal (remotely using something like PuTTY or locally...). This will display the description, release and Ubuntu codename, which you can cross reference at Ubuntu Release Versions. I recently picked up a couple ProCurve 2910al-48G-PoE switches. Since it had been a while since is setup time on a switch I had to research a bit. Here are the settings I used. First, you can view the switches current time, timezone, etc. with the show time command. Next go into config mode (configure terminal) on the switch's CLI. Now, when I run show time the switch displays the current local time!